“As early as the first decade of the 20th century enterprising companies made complete opera recordings (or at least as complete as 78-rpm technology and costs would allow). Many of these recordings are unique, irreplaceable historical documents of singers and performance practices from earlier, golden eras. For various reasons, the Metropolitan Opera waited until the LP age to make its first complete recordings. Spend a day poring over the Metropolitan Opera Archives (a wonderful service, available on the Internet), and you will quickly feel regret for the many opportunities forever lost. In an attempt to rectify this unfortunate situation, at least partially, Richard Caniell and Immortal Performances have inaugurated their Heritage Series. The new series combines studio recordings (familiar and less so) with in-performance documents to offer a much fuller picture of legendary Met casts (actual or possible, given the available artists) from the 78-rpm era. 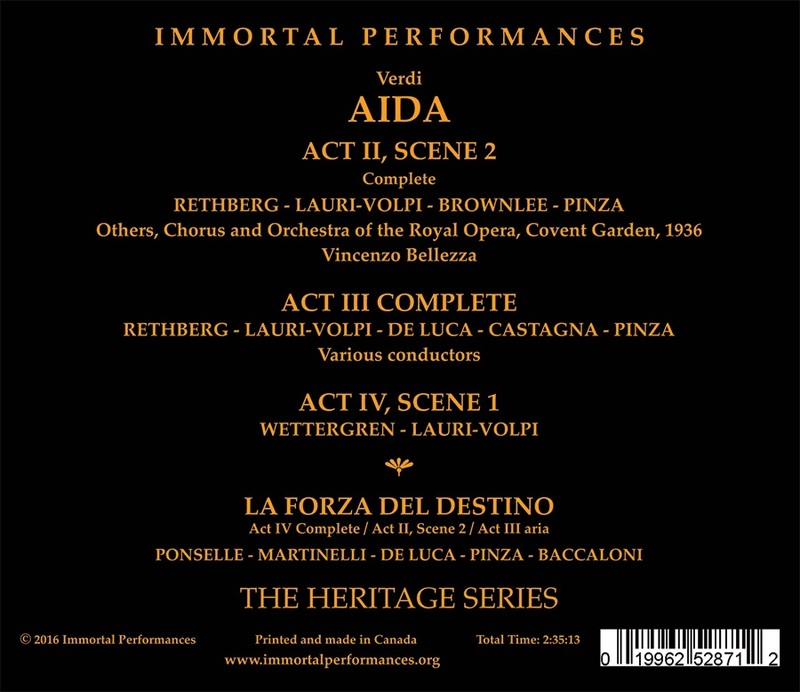 In its maiden Heritage Series release, Immortal Performances includes extended excerpts from Verdi’s LA FORZA DEL DESTINO and AIDA, cast by singers who starred at the Metropolitan Opera in the 1920s and 30s. 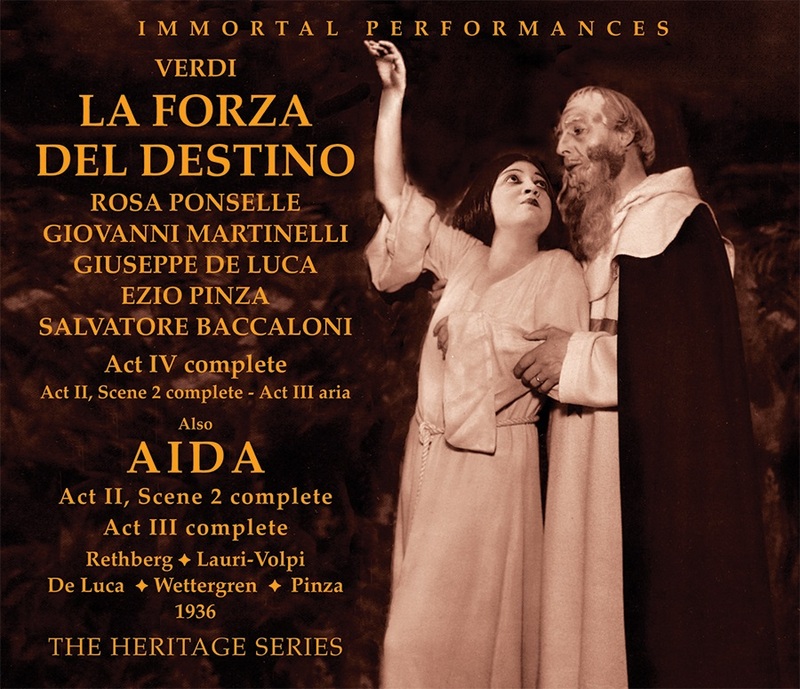 The excerpts from LA FORZA DEL DESTINO focus upon famous 1920s studio recordings made by Rosa Ponselle, Giovanni Martinelli, Ezio Pinza, and Giuseppe de Luca. These include the Cloister Scene for Padre Guardiano and Leonora, Alvaro’s great Act III aria (‘O tu che in seno agli angeli’), the final confrontation between Carlo and Alvaro, Leonora’s ‘Pace, pace mio Dio’ and LA FORZA’s concluding scene. Immortal Performances also includes the Soup Kitchen Scene preceding the Carlo-Alvaro skirmish. It is taken from a 1943 Met broadcast conducted by Bruno Walter, with Pinza as Padre Guardiano, and Salvatore Baccaloni as Fra Melitone. Pinza and Baccaloni are marvelous foils, and both sing superbly, all the while relishing the text and comic relief of a scene placed in a dark tale of revenge and murder (Carlo’s contributions toward the close, sung by Lawrence Tibbett in the 1943 broadcast, are cut in this release). The studio excerpts are familiar to collectors of historic recordings, and are magnificent. How wonderful it is to hear Ponselle, Pinza, and de Luca in their primes. And for those more familiar with Giovanni Martinelli’s work in the late 1930s and 1940s, while in his sixth decade, the 1920s excerpts may come as quite a surprise. The crystal-clear diction, amazing breath control, and extraordinary focus and power are present, but so is a warmer (dare I say ‘beautiful’?) vocal quality that was absent in later years. In any event, the studio recordings (beautifully remastered by Richard Caniell) are a ‘must’, and the 1943 Soup Kitchen Scene is a gem. AIDA is represented by two casts. 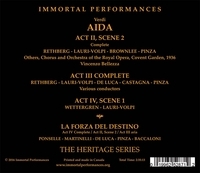 The close of the first CD, chiefly dedicated to FORZA, includes AIDA excerpts with Pinza, Martinelli, and Ponselle. Again, 1920s studio recordings are most prominent. But the excerpts begin with the initial Ramfis-Radamès exchange from a 1937 Met broadcast, followed by Martinelli’s marvelously-sung ‘Celeste Aida’, the latter taken from a 1930 Vitaphone, receiving its first CD release. Ponselle’s magnificent 1926 ‘Ritorna vincitor!’ is well known, as is the 1927 Temple Scene with Pinza and Martinelli. The Heritage Series release includes both 78-rpm sides of the Temple Scene, the first including the contribution of the Priestess, sung by Grace Anthony. It’s the first time I’ve heard that portion of this legendary recording, and it is a most welcome addition. Again, the remasterings are first-rate. The second CD is devoted to an AIDA cast including soprano Elisabeth Rethberg and tenor Giacomo Lauri-Volpi, along with De Luca and Pinza. Here, in-performance recordings play a far more prominent role. First is a 1937 NBC radio broadcast, in wonderful sound, of Aida’s ‘Ritorna vincitor!’ sung by Rethberg with a remarkable blend of elegance and passion. The Act II Triumphal Scene, performed in its entirety, is from 1936 Covent Garden productions. Baritone John Brownlee is a vibrant and intense Amonasro, and it’s wonderful to hear Rethberg and Lauri-Volpi immerse themselves completely into the music and drama. Lauri-Volpi joins Rethberg for a blazing high C before the scene’s final portion (not part of the tenor’s music in Verdi’s score, but I will hardly complain). Act III (Nile Scene) comprises the following: (1) opening (March 2, 1940 Met broadcast); ‘O patria mia’ (1927 Berlin studio recording); (3) the remainder of the Act (involving Aida, Amonasro, and Radamès) assembled from classic 1929 and 1930 studio recordings. The latter is one of the great versions of this music, with all of the artists at their artistic and vocal peaks. The Act IV confrontation between Amneris (Gertrud Wettergren) and Radamès (Lauri-Volpi) is part of the May 15, 1936 Covent Garden performance. Once again, Lauri-Volpi throws himself into the music and drama with an almost frightening intensity. Lauri-Volpi made many studio recordings in his prime, but in-performance documents from the same period are indeed rare. It’s clear that an audience brought out the best and most intense singing from Lauri-Volpi, and I am most grateful for the opportunity to hear him in that environment. Two bonus excerpts include Rethberg’s 1926 studio recording of Aida’s Act III aria, and a portion of the Act II LA FORZA exchange between Leonora (Rethberg) and Padre Guardiano (Pinza), from a 1938 KGO-NBC broadcast from the San Francisco Opera. Both feature beautiful singing, but the latter is in marginal sound at best. Still, the contributions of Pinza and Rethberg merit its inclusion. “The aim of this series is to capture as vividly as possible live performances from the first third of the 20th century....The intent for LA FORZA was to recreate as far as possible from what was available the performance of 5/9/1927. By taking studio recordings from the Met (December 1926, January, April, May, and November 1927), we have a ‘recreation’ from the Met itself. Reconstructing scenes and even operas is the intent of this series, which draws from broadcasts, private recordings and commercially available issues…. The delicacy of the orchestra at the opening of Act II, scene 2 of LA FORZA sets the atmosphere perfectly. Ezio Pinza’s smooth line is beautifully caught as Padre Guardiano ('Il santo nome'; 'Alzatevi, e partite'); when Ponselle enters as Leonora, the result is magic indeed. That one can hear the harp with such immediacy, and the distancing of the chorus as the music moves forward, is utterly remarkable. Surfaces are blissfully quiet. Martinelli’s ‘La vita è inferno … O tu che in seno’ is a masterpiece of Verdi singing, each phrase deeply considered; Salvatore Baccaloni makes short shrift of the difficulties of the Melitone’s contribution to Act IV, scene 1. Giuseppe de Luca’s ‘Invano, Alvaro’ is honeyed and intense while Martinelli’s strength is fully on display in the last part of Act IV, scene 1, the confrontation between Don Carlo and Alvaro. All ears though, surely, must be on Ponselle’s ‘Pace, pace mio Dio’ from the second scene of Act IV of LA FORZA. Her beautifully modulated cries of ‘Pace’, plus the tremendous presence of the harp, reveal just how much can be heard, and relished, in performances from this era. The finale of Act IV, with Pinza, Martinelli, and Ponselle, is little short of miraculous. There is, thankfully, full discographical documentation about the performers in each excerpt…..The Soup Kitchen Scene (Act IV, scene 1) is from a 1943 Met broadcast conducted by Bruno Walter….the jewel is the crowning ‘Celeste Aida’ from Martinelli (conducted by Herman Heller, May 1930, from a rare Vitaphone original)….Pinza’s ‘Nume, custode e vindice’ is a masterpiece of Verdi singing….